You can now go online to look at our catalog. Please go to catalog on the horizontal menu bar of the website. You will leave the website page and be taken directly to the catalog. Go to "change your password" on the left side, and change your password. Also the login information for our downloadable books has changed. It is the same as above. Please also enter your email address. This will enable you to get notices about when books are due, overdue books or holds that are available. When you change your password in our system, that will change the password with Overdrive and Lynda.com also. 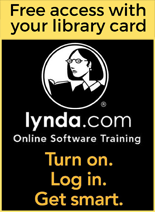 The above login procedure also works for our new Lynda.com online training. Have you read all the books by your favorite author? Did you just finish a book that you really loved? Do you want to read another book just like it, but you don't know what to try? The following sites can help you find a book that you will enjoy! Goodreads: https://www.goodreads.com Get recommendations from what you've read or what your friends are reading, rate books that you've read. LibraryThing: https://www.librarything.com Get recommendations based on what you've read. What Should I Read Next:https://whatshouldireadnext.com One of the best things about What Should I Read Next is that you don’t need an account to sign in. You just type in a book you like or that you’ve read, and it populates a list of similar books. and 450 lessons for ages 2-7. Help your child build a strong foundation for future academic success. Come into the library and play and learn. The free lessons are only available at the library.